I scored one FTF (first to find) on a geocache in 2007, one in 2008, a record three last year, and just found my third of the month in January 2017. So they've become more routine, and perhaps less deserving of their own posts. The fact that it was named "King of the Hill" probably should have prepared me for a bit of a challenge. 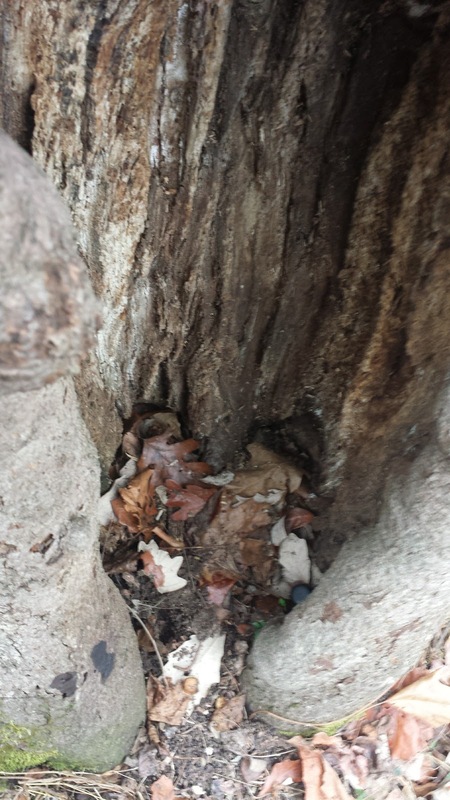 The description said, "There are plenty of difficult ways to the cache, but I will say there is an easy way to it." The satellite imagery gives some hints as to the difficulty. 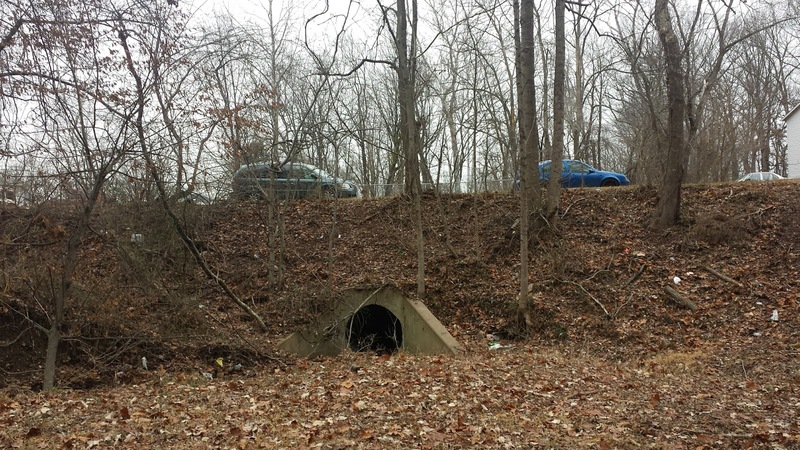 It's in a stand of trees -- but how do you get there from the road? The beige strip to the southeast of the cache is actually a concrete gully, so you have to pick your spot. You can't see the elevation changes, but that also factors in. As it turned out, near the clearing, there's a place to hop over the gully where the vegetation is not too thick, and then there's sort of a trail heading up. The hint really narrowed down the number of possible hiding locations, so once I was up there, it wasn't too hard to find...and then my pen wouldn't work to sign the log. Now, sometimes it's possible to take a picture of the log, or count making an indentation in the paper as "signing", but this seemed inadequate for a first-to-find claim. First I tried breaking open my pen to see if I could get ink out that way...no dice. Then I tried dipping the pen in a nearby berry; that sort of worked, but didn't. Fortunately, in the process of doing so, my pen started working again. 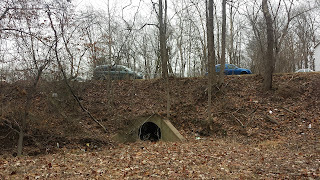 Given the terrain, I didn't think it would be found as often as some other caches. It was found again three days later, and then a day after that. That finder forgot their pen, so despite my forgetting to take pictures of my adventure, I do have a picture of my scratching at the log from them. So, what does this do for my stats? Well, most obviously, it is a record FTF month for me. Also, the hike up the hill made the terrain a 3.0, but the ease of finding the cache was rated 1.5. That's a new combo for me, the 28th out of 81 possible. And the cache was hidden in the waning days of 2016, although not published until January 2017. That's my first December 2016 find, for Month 126 (75 to go). 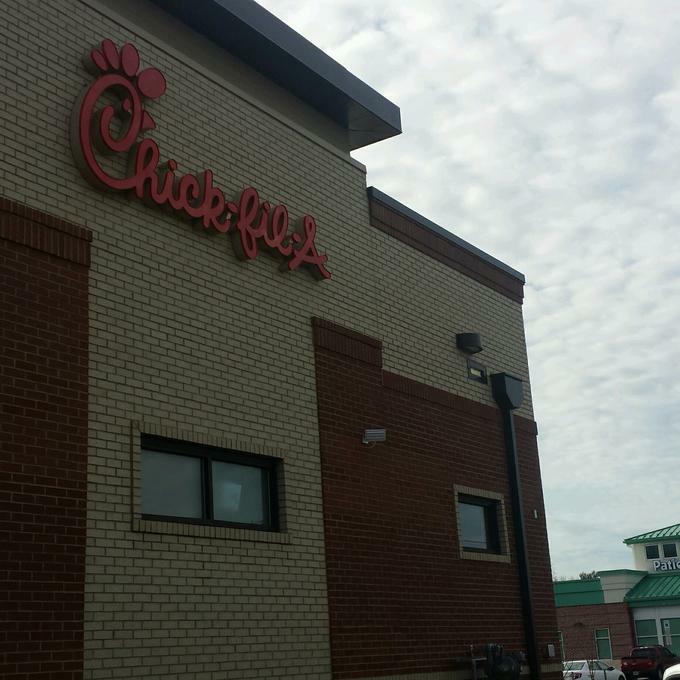 Finally, it's my first FTF in Fairfax County, Virginia. 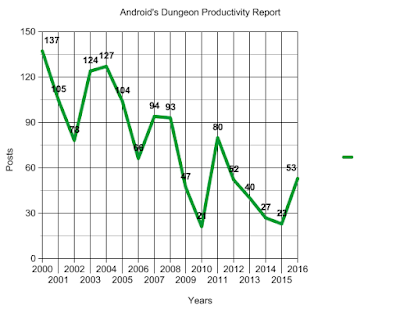 Mildly amusing, and a stat that Project Geocaching keeps track of. If New England goes to the Super Bowl, nobody wins the SAH Bowl. Wait, what? I just went to check things out, and it appears Seattle beat both of them. Oops. So congratulations Seattle. Time for my annual-ish project of recapping the books I read in the previous year. Lots of graphic novels once again really juiced the total. 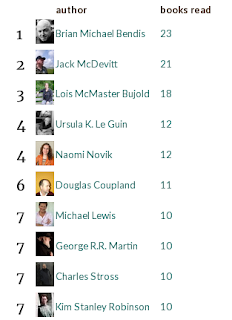 I'm going to eschew the links to the Goodreads reviews to save me time this year, but you can see them all here. Brian Michael Bendis is now my most-read author, after not making the top 10 two and half years ago. 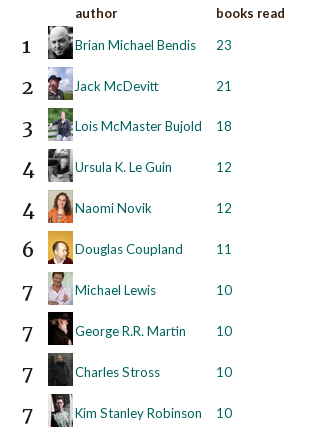 Robert Silverberg slipped out of the top 10 as a result. Jessica Jones: Alias, Vol. 1. 5 stars. "This volume is a nice exploration of the seedy side of Marvel." Guardians of the Galaxy/All-New X-Men: The Trial of Jean Grey. 4 stars. "A fun Guardians/X-men crossover." Guardians of the Galaxy, Volume 3: Guardians Disassembled. 4 stars. "This did a good job at reminding you who each of the Guardians were, while still moving along the story." Jessica Jones: Alias, Vol. 2. 5 stars. "I continue to enjoy the comic more than the TV show (and I enjoy the show)." Alias, Vol. 3: The Underneath. Ultimate Comics Spider-Man - Volume 2. 4 stars. "It felt like it moved a little slowly." Ultimate Comics: Spider-Man, by Brian Michael Bendis, Volume 3. 3 stars. "It descended into Ultimate Universe silliness with Captain America as President and the Battle of Wyoming. Whatever." Guardians of the Galaxy, Volume 4: Original Sin. 3 stars. "If you want GotG to deal with the Cancerverse and Venom, this is the book for you. I don't." Jessica Jones - The Pulse: The Complete Collection. 5 stars. "If I had any complaints, it was that the plot jumped from this to that, but it's a comic book, what did I expect?" Daredevil by Brian Michael Bendis & Alex Maleev Ultimate Collection, Book 1. 4 stars. Ultimate Comics Spider-Man by Brian Michael Bendis Volume 4. 4 stars. "Some quality Miles Morales storytelling." Daredevil by Brian Michael Bendis & Alex Maleev Ultimate Collection, Book 2. 4 stars. Daredevil by Brian Michael Bendis & Alex Maleev Ultimate Collection, Book 3. 4 stars. Spider-Man: Miles Morales Vol. 1 (Spider-Man (2016-)). 4 stars. " This is just as good as you'd expect given Bendis' previous Miles Morales work." Guardians of the Galaxy: New Guard, Volume 1: Emperor Quill. 3 stars. Drive. 4 stars. "This 7-page story is the long version of [the opening paragraph of Leviathan Wakes]. It's good, but not as good as the [that] paragraph." Leviathan Wakes. 4 stars. "I found the story compelling and enjoyable, but I am not quite sure what to think of the turn it took halfway through." Caliban's War. 4 stars. "I continue to enjoy this series. I'm still not 100% sure about the genre mishmash." The Butcher of Anderson Station. 4 stars. "A bit short for two bucks, but something to pass the time while I have the next book in the series on hold." Abbadon's Gate. 4 stars. "I enjoyed this more than I expected." Gods of Risk. 4 stars. "I thought the main character was really well-drawn, as a teenager in over his head -- as most teenagers are." Hawkeye, Volume 1. 5 stars. "It's a clever, snappy, above-average comic book that was still a lot more fun than it should have been." Hawkeye, Volume 3: L.A. Woman. 4 stars. "It was still good fun particularly since I enjoy the more down-to-earth superhero antics." Hawkeye, Volume 4: Rio Bravo. 4 stars. The Immortal Iron Fist: The Complete Collection, Vol. 1. 4 stars. "It was good enough that I incurred overdue fines to finish it." The Lies of Locke Lamora. 4 stars. "This is a very good book, and it was fun to read." Red Seas Under Red Skies. 3 stars. "It was exciting, and the characters were unique and fleshed-out." Republic of Thieves. 4 stars. "The writing seemed to have matured." The Unbeatable Squirrel Girl, Volume 3: Squirrel, You Really Got Me Now. 4 stars. "Fun, without being cloying." The Unbeatable Squirrel Girl Beats Up the Marvel Universe. 4 stars. "This book worked pretty well as a satire of a variety of other Marvel Universe titles from years past." The Unbeatable Squirrel Girl, Volume 4: I Kissed a Squirrel and I Liked It. 4 stars. "Charming." Hulk: Planet Hulk. 2 stars. "It wasn't to my taste." Hulk: WWH - World War Hulk. 3 stars. "A lot of smashing wrapped around a fairly straightforward story"
The Totally Awesome Hulk, Volume 1: Cho Time. 3 stars. "Some fun stuff but so, so, sexist." Ms. Marvel: Vol. 5: Super-Famous. 3 stars. "It got a little silly in parts." A-Force, Volume 0: War-Zones! 3 stars. "I was mildly entertained." A-Force, Volume 1: Hypertime. 3 stars. Bloodline. 4 stars. "This is the best of the new canon works that I've read." Lost Stars. 4 stars. "This book did something that none of the other new Star Wars tie-in books did; it made me care about characters who weren't from the movies." Hawkeye, Volume 5: All-New Hawkeye. 3 stars. "The storytelling wasn't as compelling as the previous amazing volume." Descender, Vol. 1: Tin Stars. 3 stars. Before the Awakening. 3 stars. Amazing Spider-Man: Worldwide, Vol. 1. 3 stars. "What dragged this down for me was how ridiculous Zodiac was as a villainous organization." Amazing Spider-Man: Worldwide, Vol. 2. 3 stars. Luke Cage: Avenger. 3 stars. "This was a mishmash of stuff." Gentleman Jole and the Red Queen. 4 stars. "It wasn't very exciting, as all of the conflict was internal." Ready Player One. 3 stars. Black Panther: A Nation Under Our Feet, Volume 1. 3 stars. Club Soccer 101: The Essential Guide to the Stars, Stats, and Stories of 101 of the Greatest Teams in the World. 4 stars. "It fails to be 5 stars only because alphabetical order is a weird way to read them." The Unbeatable Squirrel Girl & The Great Lakes Avengers. 3 stars. "The real star of this book in my view is the Great Lakes Avengers who are an interesting group in their own right." The Force Awakens. 4 stars. "I liked it because I like the story from the film." The Weapon of a Jedi - A Luke Skywalker Adventure. 3 stars. Darth Vader, Vol. 1: Vader. 4 stars. "It really captures the spirit of what made Darth Vader cool in the original trilogy without layering on too much new crap." Guardians of the Galaxy & X-Men: Black Vortex. 3 stars. "Parts of it were fun." Spider-Gwen, Vol. 1: Greater Power. 3 stars. "I didn't find it compelling." The Daughter of Odren. 4 stars. Patsy Walker, A.K.A. Hellcat!, Volume 1: Hooked On A Feline. 3 stars. "It was fine." Catalyst (Star Wars): A Rogue One Novel. 4 stars. "This was interesting in its own right." My Search for Ramanujan: How I Learned to Count. 4 stars. "Overall, I found the book very interesting." Moon Girl and Devil Dinosaur, Vol. 1: BFF. 3 stars. "I liked Moon Girl. I did not like Devil Dinosaur." Fantastic Beasts and Where to Find Them: The Original Screenplay. 3 stars. "I wish Rowling would go back to writing novels." Calamity. 3 stars. "This series definitely did not live up to the potential of the first book." Saturn Run. 4 stars. "The second half of the book really kicked things up a notch." Lando. 3 stars. "A pleasant enough read." Harry Potter and the Cursed Child. 3 stars. "This relied heavily on one of the things that bothered me by the end of book seven, namely the inbred nature of the wizarding world." Princess Leia. 4 stars. "It does what a tie-in should do by enriching the back story rather than complicating the events of the movies." Star Wars: 5-Minute Star Wars Stories. 4 stars. "It's a good way to induct your kids into the cult of Star Wars even if they're too young to see the whole movies." 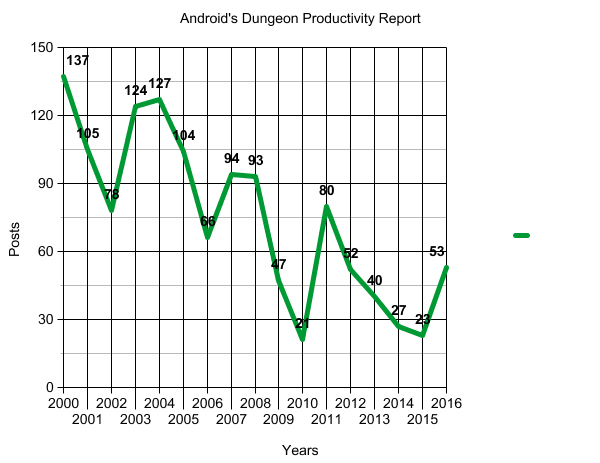 For some reason, it's been three years since my last Android's Dungeon Blogging Productivity Report. But I thought I'd fire up the Department of Education's graph generator one last time before Trump shuts it down. 2016 featured a bounce-back to 2012-era levels of blogging. 2014 and 2015 were two of my three lowest years, so I guess it's OK I didn't write reports for those years. My three most popular labels last year were geocaching (23), soccer (13) and travel (11). (Some posts had multiple labels.) Those seem like topics of interest going forward, although I don't have a lot of travel planned just this instant. My most popular post of the year was my father's eulogy, with 256 views to date. My least popular post, with 8, marked visiting my 32nd country. Most of my other posts received 15-40 views, which I'll take. Anyway, if I can reach 50 in 2017, I think I'll be happy, particularly if 15-40 people are willing to read my perspectives on geocaching and Scottish soccer. Well, I did such a great job with last week's preview, that I can just read the state of affairs off there. If New England goes to the Super Bowl, there is no winner. If Pittsburgh does, we have a winner, which will be Dallas if Green Bay goes, and Philly if Atlanta goes. For a reminder of what I'm talking about, and a preview of this year's Stay-At-Home bowl, please see last week's post. Well, those wild card playoffs really collapsed the timelines, didn't they? With Miami and Detroit out, Tennessee's possibilities are narrowed to KC-Green Bay and Houston-Green Bay. With the Giants out, Philadelphia is down to Pittsburgh-Atlanta and Pittsburgh-Dallas. With the Giants and Lions out, Green Bay is down to Houston-Seattle. Dallas is down to Pittsburgh-Green Bay. Tampa still has KC-Atlanta and KC-Seattle. Pittsburgh, Houston and KC are eliminated. San Diego still has Houston-Atlanta. Atlanta and Seattle are eliminated. If KC goes, there is a winner, unless Dallas goes. If Pittsburgh goes, there is a winner, unless Seattle goes. If Houston goes, there is a winner unless Dallas goes. So six teams are alive under nine of the sixteen remaining scenarios. There will be no shared victory this year. Since the Patriots are the overwhelming favorites in the NFC, there is a good chance of no winner. Still, the Steelers are second-favorites, and a Pittsburgh-Dallas SB would make Philly the winner. Stay tuned next week, when we will be down to four teams, four possible Super Bowls, and anywhere between one and four possible stay-at-home scenarios. I described the "First to Find" (FTF) side game in a post from last June on the occasion of my third FTF. (It's an unofficial statistic about who finds a cache first after it's been published.) The other day, I received an alert a few miles away from where I was, so I drove over there. It required clambering down a hill and jumping over a small stream. Once I was there, however, the cache wasn't too hard to find. It's actually in this picture. It looks like the second finder showed up 25 minutes later. On my way there, however, I got an alert for a second hide less than a mile away. This was not a coincidence -- they were both hidden by the same user. It would have been unlikely for it to be otherwise -- these were only the 4th and 5th caches hidden in the DC area in 2017. So I rushed off to the next cache. It was a little trickier, but I persisted. The guy 25 minutes behind me on the first walked to the second, and failed to find it an hour after I claimed the FTF. I didn't think to take a picture there. So, two FTFs in one day, and my fifth and sixth overall. What other statistics have I updated since my last post? I am up to 227 caches found overall. 2016 was my most productive caching year, with 134 total finds. I have now found caches hidden in 125 months, which keeps pace, as the total number of months geocaching has been around ticks up to 201. Welcome to the second annual Android's Dungeon Stay-At-Home Bowl preview. As is our tradition, we begin by reminding you what the Stay-At-Home Bowl is. It's awarded to the team or teams who defeat both Super Bowl participants. Last year, nobody won it. Why is it the 2016 Stay-At-Home Bowl rather than the 2017 edition? Is it in honor of the regular season where most of the games were played? Or did I just forget what year it was last year when I ran the 2015 Bowl? Who knows? Before the playoffs start this year, which teams are eligible? And which teams should be considered favorites? The way I thought about this last year is that there are 36 possible Super Bowl matchups at this point, since there are 6 teams left in each conference. Let's consider the total number of possible Super Bowl matchups that will make each team a "winner." In this scenario, Tennessee is the favorite, since they were the only team to defeat multiple playoff teams from each conference. They win if the Super Bowl is Miami-Detroit, Miami-Green Bay, KC-Detroit, KC-Green Bay, Houston-Detroit, or Houston-Green Bay. Two teams have three possibilities: Philadelphia and Green Bay. Two teams have two possibilities: Dallas and Tampa Bay. Six teams have one possibility: Pittsburgh, Houston, KC, San Diego, Atlanta and Seattle. As last year, playoff teams are heavily represented here (7 out of 11) and stay-at-home teams make the playoffs a lot (7 out of 12). Looking back at the Tennessee scenarios, those seem pretty unlikely Super Bowls. So let's grade each team's chances based on the seeds of the playoff teams they beat. Basically, assign six points to beating the number one seed, down to one point for beating the number six seed. For each possible scenario, multiply the two numbers together, and add all possible scenarios. So beating both number one seeds (hypothetically, nobody did) would be worth 36 points, while beating both number six seeds (as Tennessee did) would be worth 1. I won't run down the full list, but Philadelphia is in first at 52 points with Pittsburgh-Dallas, Pittsburgh-Atlanta and Pittsburgh-Giants being relatively likely Super Bowls. Then comes Tampa Bay with 45 points on the strength of Kansas City-Atlanta and Kansas City-Seattle. Tennessee's six scenarios garner 36 points, and Seattle gets 35 from New England-Atlanta and Miami-Atlanta. Stay tuned next week, when we cut down to 16 scenarios.